We wanted to try The Moss Room, Loretta Keller's new restaurant at the newly opened California Academy of Sciences. The decor, including a 2 story moss wall, was impressive. The food, on the other hand, was decidedly not. Also, although the menu listed both appetizers and entrees, the portions were exactly the same, it was just the prices that were different. The service was also still trying to work out the kinks. We had to check in while still in the Academy of Sciences, in front of the elevator. Then we had to wait with several other people and another hostess in an elevator that other people were trying to get into to go other places. It was a bit of a mess. Also, it took forever to get our food. It is rare that we send something back but this soup was so salty it was completely inedible. And even if it had been decent the portion was alarmingly small. This was small, but it was tasty, although there were too many chickpeas and not enough squid. These were ok, but not great, and seriously, I've never felt more ripped off. It was about $4.50 per ravioli--ridiculous. Somehow we forgot to take a picture of these, which is a shame, since they were the best thing that we ordered. We went to a friend's wedding at Yank Sing. We'd only ever been here for dim sum, and the dim sum is quite good, so we expected that the banquet would be good as well. It was. Succulent duck (above) tucked into pillowy rolls (below) slathered with hoisin and topped with scallions. The snap peas were crunchy and tasty, but the beef had a strange texture that didn't make us want to eat more. The BBQ pork was excellent, as was the roast pork (although it would have been better hot). Everything else was fine, but not amazing. These are the house special at Yank Sing. They are filled with a hot soup that bursts in your mouth when you bite it. They get the soup in the dumpling by mixing it with gelatin, then cooling it until it is a solid. They then place cubes of the gelatin-soup into the dumpling wrapper, seal and steam. Giao says this was really good, but I don't like the gelatinous texture. The candied walnuts were really good, but we aren't really fans of the sweet Chinese mayo these shrimp are coated in. Giao LOVED this chicken. It was apparently juicy and the skin was very crispy. Unfortunately, chicken is one of my pregnancy aversions. These cupcakes were surprisingly moist and the buttercream frosting was very tasty, but ratio of frosting to cake was way off--too much frosting. This sounded better than it was. For some reason the sauce and the shrimp just didn't mesh that well. I simply sauteed some prawns in the fenugreek cream sauce that I usually use for lamb chops, and then poured it over some leftover bulgar pilaf. 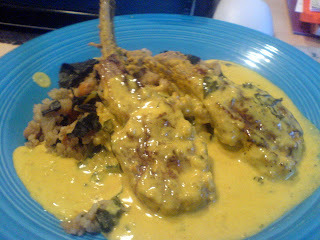 These lamb chops are a favorite, every since I got the Vij's Restaurant cookbook. I've finally perfected the sauce, in that it no longer breaks. This time we paired it with a pilaf of bulgar wheat, garbonzo beans, chard and caramelized fennel and onions. The sauce worked well with both the lamb and the pilaf. Sautee the onions and fennel over low heat for a long time, in a large pan. In a sauce pot, boil water and cook the bulgar as you would pasta, for about 25 minutes, or until tender. Drain off excess water and set aside. When the onion/fennel mixture is carmelized, add the chard and sautee until tender. Then add the cooked bulgar and the garbonzo beans and stir to combine. Serve as a side.